You know something, I can always tell when a brewery is owned by one of the big three (Coors, Miller, Anheuser Busch) due to the crappy, simple, mainstream looking labels. Well, I was right AGAIN! I don’t even have to read about it to know. Miller Brewing Company, a subsidiary of SABMiller purchased this brewery back in 1988. 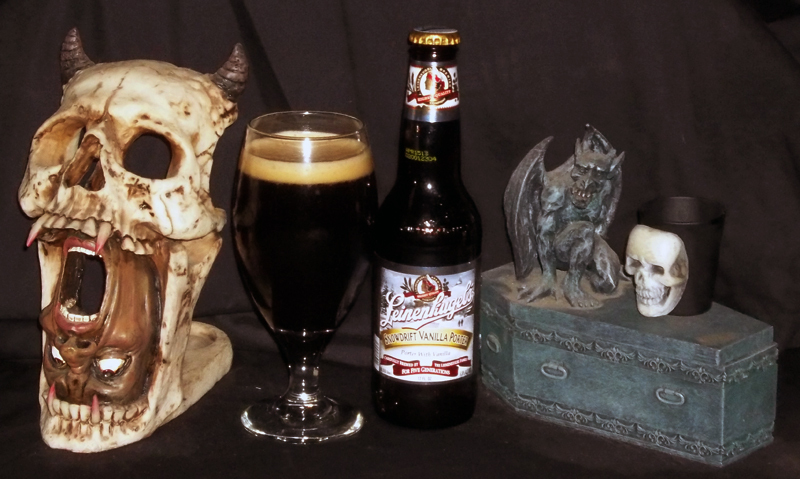 I have had a few different beers by Leinenkugel before, and I thought I’d go ahead and give one of their newest beers a try. Snowdrift wasn’t the worst beer I have ever had, but it definitely wasn’t the best either. Read on, get your idea of this beer, and try it for yourself, if you’d like! I used a porter-stout style glass, the beer poured a very thick looking black color with a dark brown frothy head about 3 fingers wide, which quickly went down to a very thin line on top, leaving only a light ring residue on the glass while drinking. Damn, it poured and looked great for a such a short time. The aroma of the beer was a combination of vanilla, caramel, roasted malts, and brown sugar. The vanilla was more in the background here, with caramel and brown sugar smells up front. Taste wise though, the vanilla seemed to be the main flavor going on here. I would then get the taste of alcohol, and the beer would finish like a typical porter, just malty. One thing that was really bothering me though was the fact that I could not get past the “big beer” taste. This beer reminded me of New Castle behind that vanilla. This mass produced factory beer was just not cutting it for me. Do I hate everything related to the big 3? No, not really, but it is very hard for me to find the ones that I do like. The one good thing about this beer is that the medium body, and smooth mouth feel makes this a beer easy to drink, which was good for me, cause I got through it quicker! Haha! This is definitely my least favorite Vanilla Porter I have had. Not that Leinenkugel or SABMiller really care about my opinion, as I am just one beer drinker in this entire world, but if they really wanted to ever be taken serious in the craft beer world, then lose the “big beer” taste, and actually put some heart and soul behind the beers, and maybe, just maybe, I will at least enjoy a beer or two! Snowdrift made me think of winter, and winter made me think of the band IMMORTAL. This being my least favorite Vanilla Porter, and laughing at the fact that this is a big 3 type beer, I wanted to use a song and video that has always made me laugh as well. I give you “Blashyrkh (Mighty Ravendark)” from their 1995 album, Battles in the North.